Recently I migrated our company to Office 365. It was a big change, since we used to use Office 2003 that was connected to Exchange Server 2003 Onsite. One of the biggest changes about Outlook 2013, is that when the Calendar reminder window “pops up”, it usually stays “hidden” behind many other windows. It does play a sound and the window “blinks” yellow in the task bar, but if you’re concentrating on something else, it’s easy to dismiss it, and you could find yourself running late to a meeting. Microsoft has designed it to work that way, so that if you’re in the middle of something and don’t see the pop up window, you won’t press “Enter” by mistake, confirm the reminders and make the window disappear. Hence, when Outlook 2013 calendar reminder window pops up, it becomes hidden since there are other open windows covering it. One simple solution is to set a different – more noticeable – sound to the reminder window. You can do that by opening Outlook -> File -> Options -> Choose “Advanced” on the left side -> Click “Browse” and choose a different sound under the “Play Reminder Sound” field. Of course – this simple solution won’t help you set Outlook reminders to stay on top. 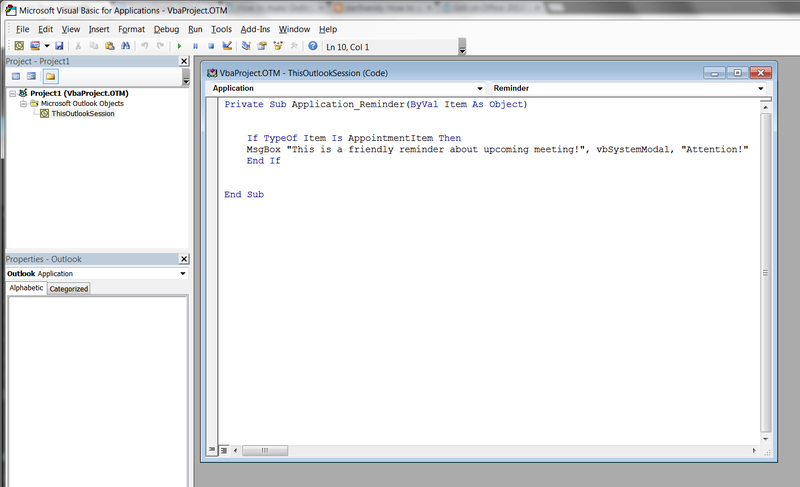 The real solution here is a VBA based code (Don’t freak out, it’s pretty simple and easy to create) that pops up a customizeable message box that stays on top of every other window, and you can’t ignore it. 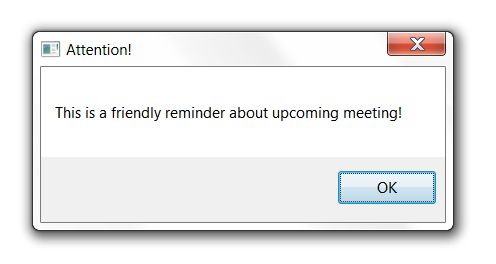 The only con I find for this solution, is that this message box comes before the reminder window, and in order to view the reminder window, you need to click “ok” on the message box. 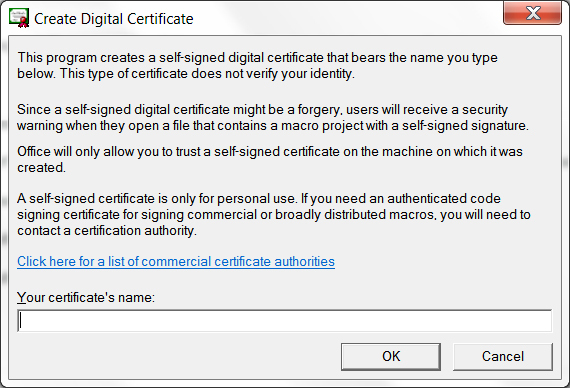 I read on many websites that you need to click “Start” and type “Certificate” and then choose “Digital Certificate for VBA Projects”, but it will not work in Office 2013 / Windows 7. In order to Create a Digital Certificate, we need to run the file “SELFCERT.EXE”. Here is the file location: “C:\Program Files\Microsoft Office 15\root\office15”. 2. Name your certificate and click “OK”. “outlookreminder” for example [without the quotation marks]. 3. You’ll get a message says “Succesfully created a new certificate for outlookreminder”. Click “OK”. 4. Go to Outlook, and press ALT + F11 to open the VBA Editor. 5. On the left side, you’ll see “Project 1”. Double click, it will expand and you’ll see “Microsoft Outlook Objects”. Double Click it, it will expand and you’ll see “ThisOutlookSession”. Double click it. 8. Click Save [Don’t exit yet!]. 9. In order to run the macro, we need to “sign” it. To do that, go to Tools -> Digital Signature -> Click “Choose” and select the certificate name we’ve created before [I named it “outlookreminder”, remember?]. 10. Click “OK”, save again and close the window. 11. Now – since this is a macro, we need to allow it in Outlook. I’ve tried to allow this macro specifically with no success. I had no choice but allowing all macros. It’s not risky in my opinion, but do it at your own risk. 12. In Outlook, Go to File -> Options -> Trust Center -> Trust Center Settings -> Macro Settings -> Check “Enable All Macros”. Click “OK”, close Outlook and open Outlook again. 13. From now on, every time there’s a calendar reminder, you’ll get a message box that will stay on top of each and every window, and trust me, you WON’T ignore it.